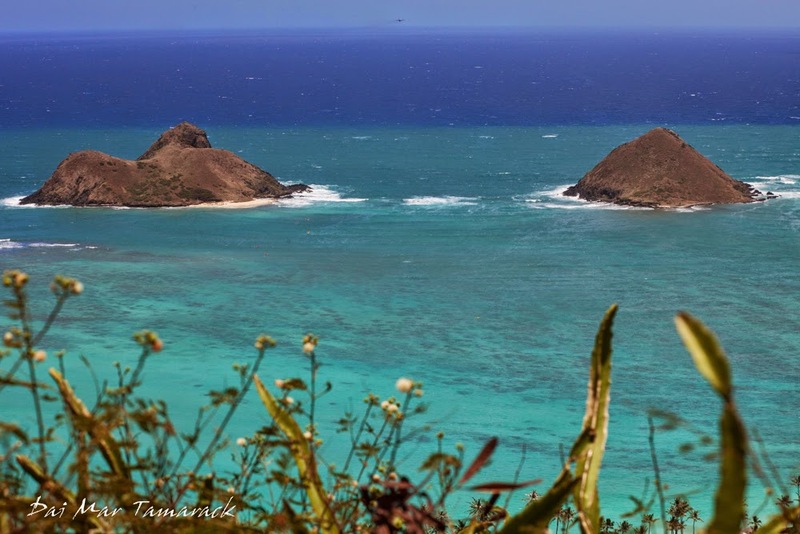 Even on misty rainy days Lanikai can have its own batch of sunshine. The weather turned beautiful and sunny as soon as we started the hike. 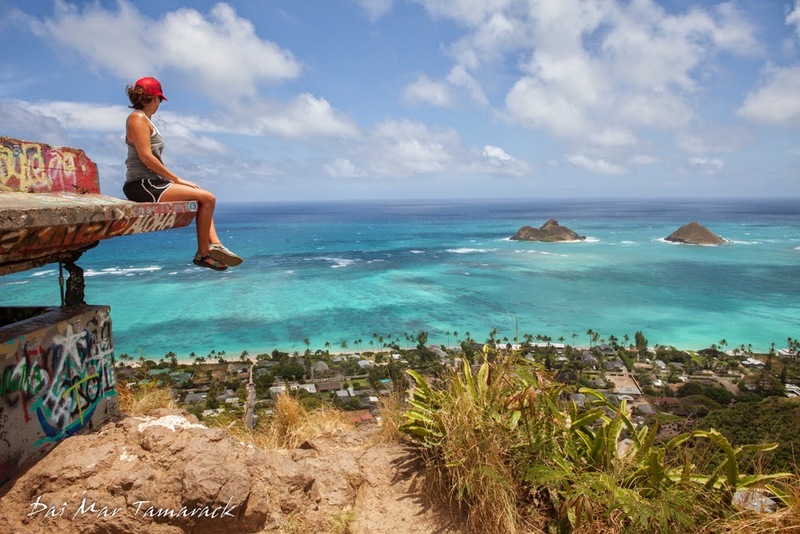 The pillbox hike heads into the brush back behind the luxurious neighborhood of Lanikai. A bright pink sign tells you that you are on the right path. After a steep climb the hike emerges on the open ridge line. 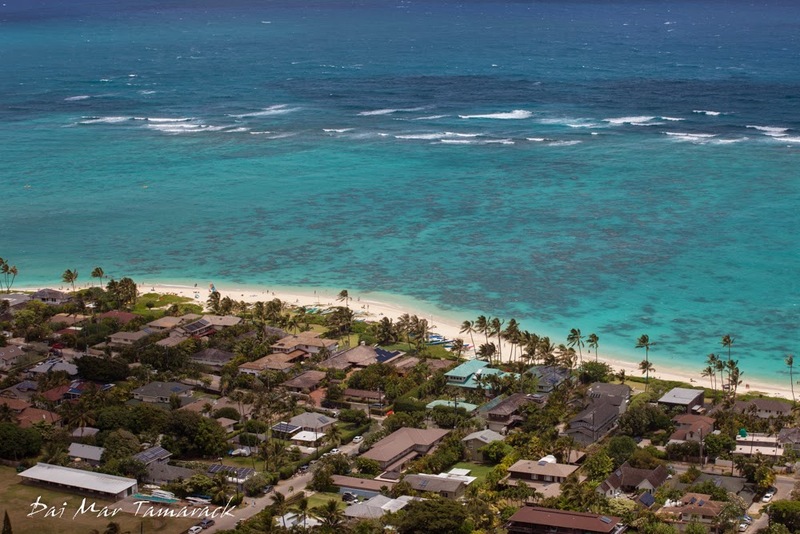 Beautiful views of Lanikai beach and the offshore islands greet you at each new stopping point. It's important to keep an eye on the trail though as a false step could lead to long tumble down the mountain. Three old military pillboxes are set on the high points of the ridge. Colorful graffiti lines the concrete structures. 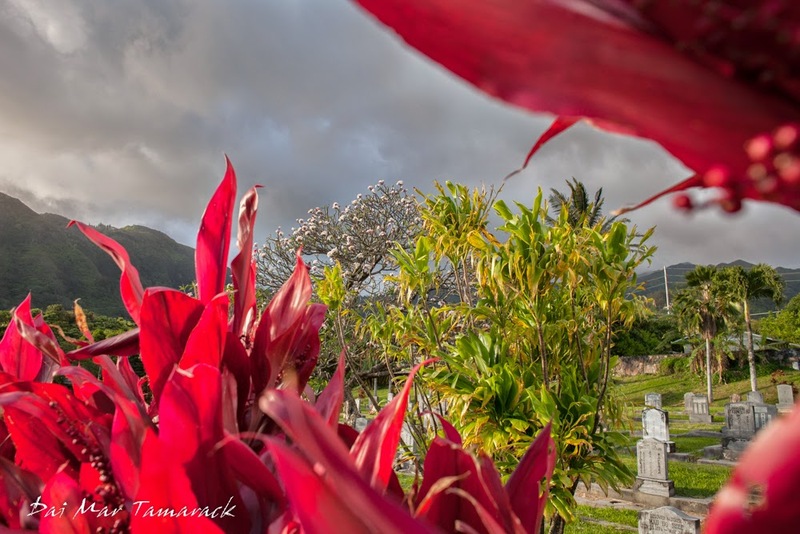 It provides a lot of color to an already colorful scene. I've taken a picture of Heidi sitting on top of this structure before but the lighting today was perfect. 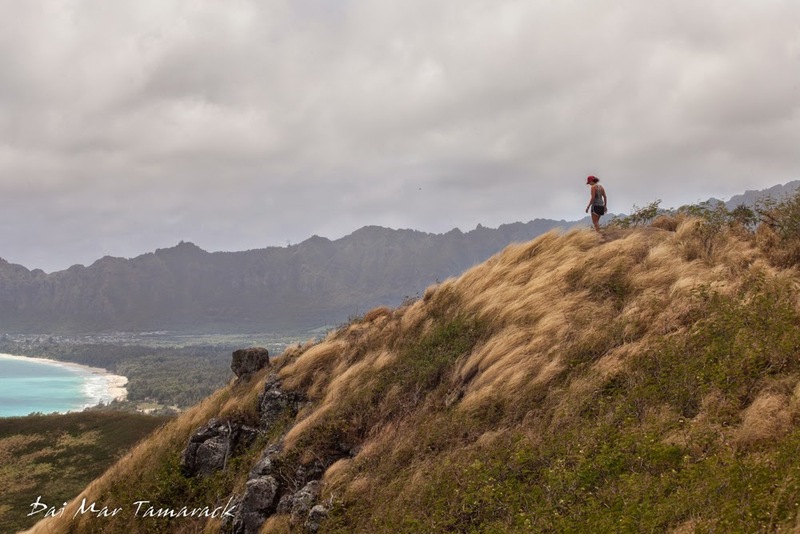 We continued on past the second pillbox where the ridge line turns away from the coast and heads back towards enchanted lake in Kailua. 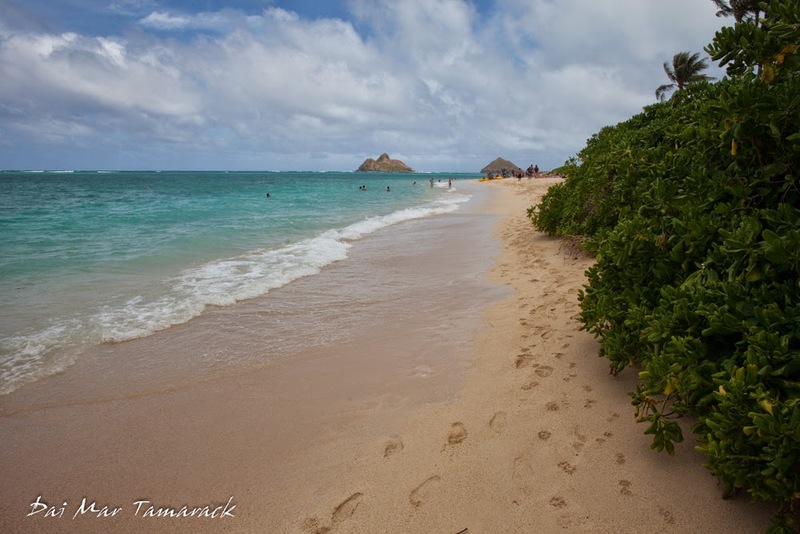 We found the third pillbox and trekked a bit further before turning back and cooling off at the beach. With a last minute trip cancellation and a surprise day off I took to the unknown. 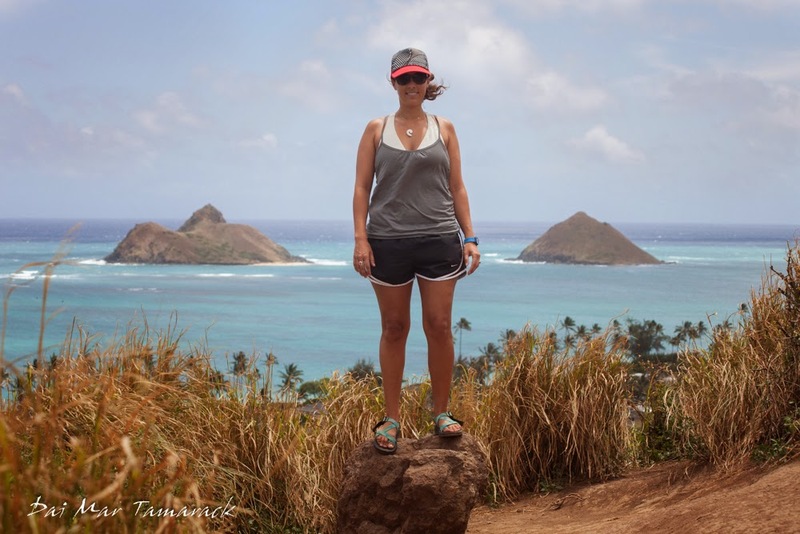 I have been on a forbidden hike kick for the past week so I thought I would keep the momentum going by finding the off limits Hanauma crater rim hike. I also knew that there was a natural rock arch in the area but couldn't find great directions. I've had such good luck lately with finding secret waterfalls and hidden ruins that I thought my luck might hold. I knew to access the crater rim hike I should park in the neighborhood just west of the crater. After this I was on my own. I headed up the next road and started to climb up the hill next to a fenced off water tank. It didn't look like a trail but I was headed up which was the right direction. 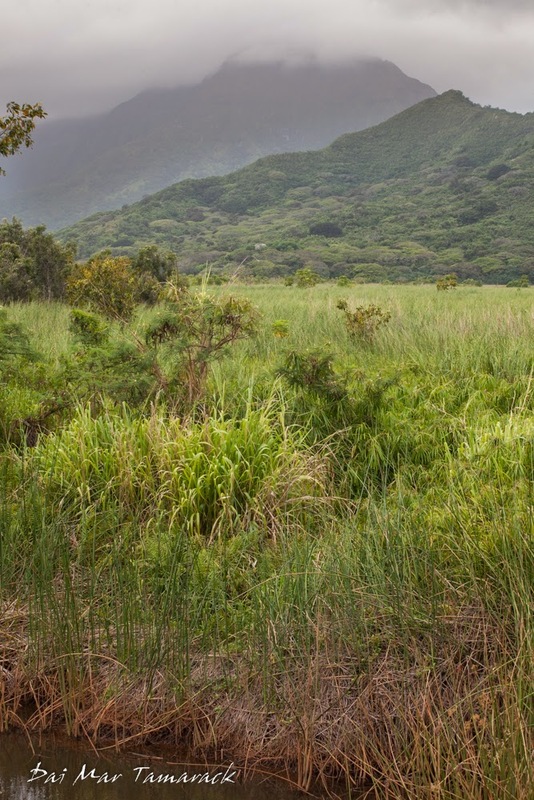 I scored some beautiful views of Koko crater with arid grasslands in front and a dark and storm sky behind. I typically hike in sandals so I had to pay special attention on this climb to avoid any cactus confrontation. 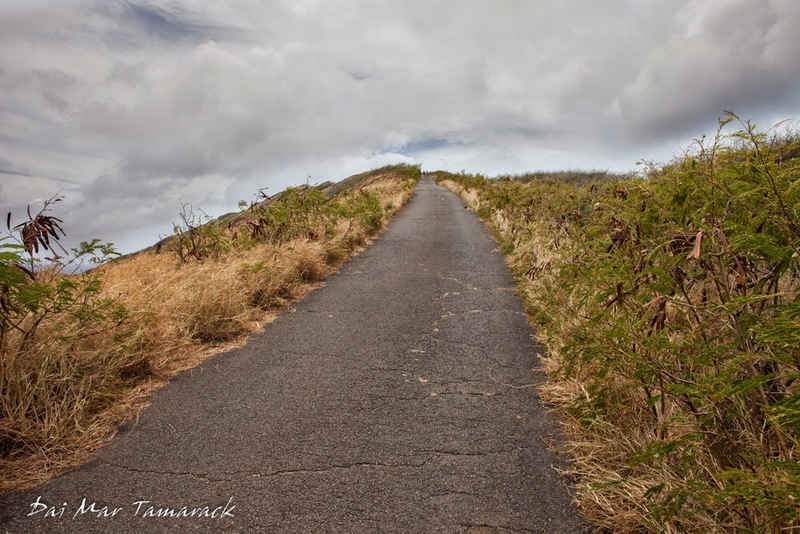 After finding the paved trail on the crater rim I knew I had missed the trail up. 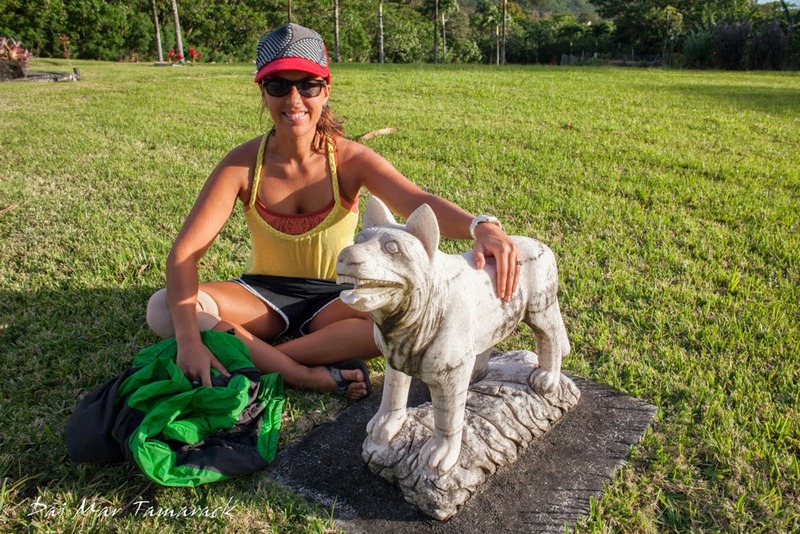 There were families, young kids, and even people hiking with dogs. This must be the most unforbidden 'closed' hike I've ever been on. 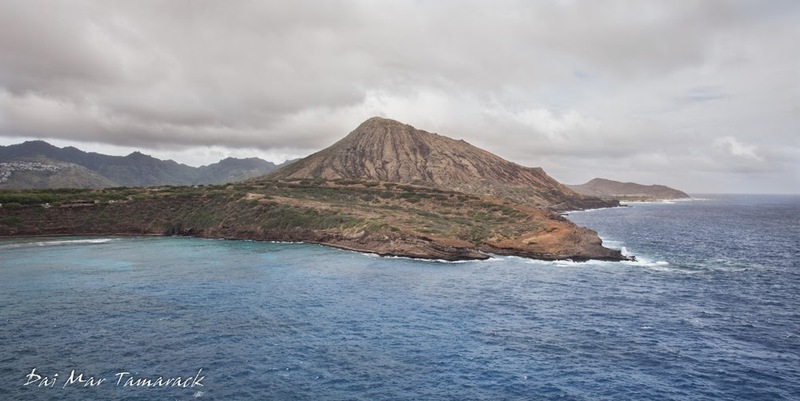 But the views down into Hanauma were beautiful as I continued to climb higher. The paved trail ends at an old military outpost. At this point I was feeling good and not too hot so I decided to keep going on what looked like a trail farther down towards the point. 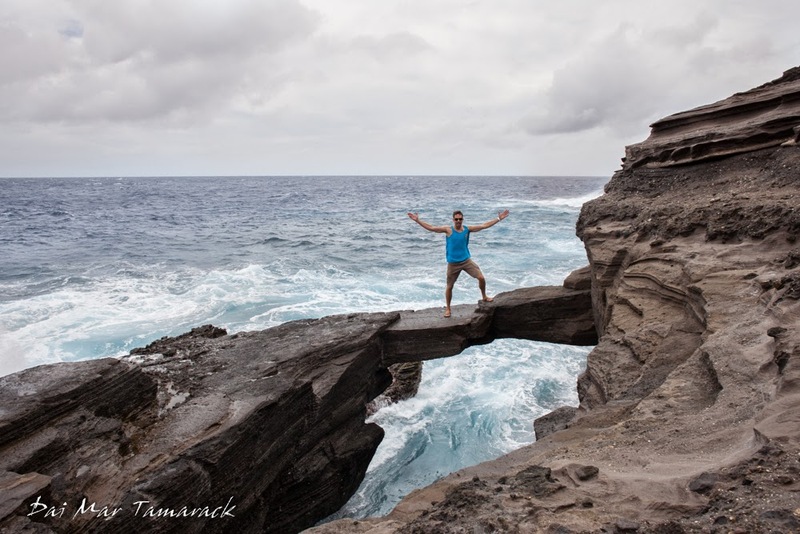 And who knows, maybe I would even stumble upon the mysterious natural rock bridge. After a lot of backtracking up and down little paths I arrived at a stunning rocky ravine. 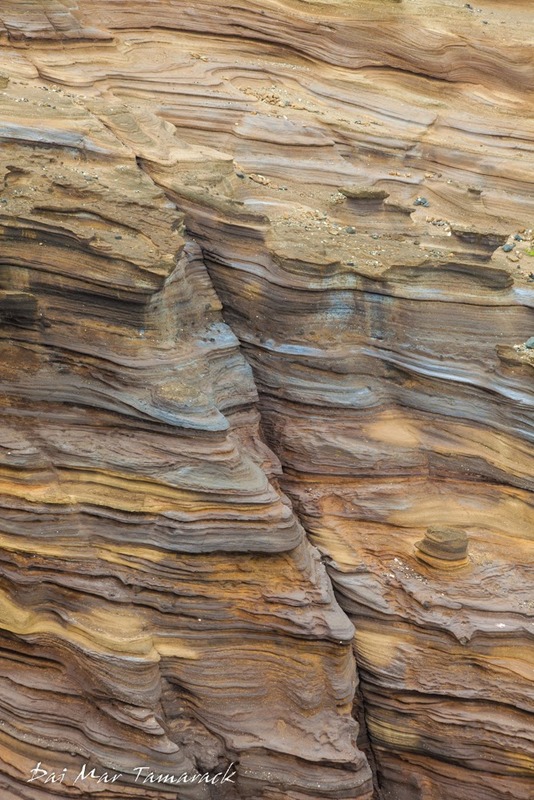 The rocks here have been carved out by erosion in fantastic designs. I managed to rock climb my way down into the ravine to snap a few pics. I didn't see the rock bridge anywhere so I climbed up and out the opposite side to continue my trek. 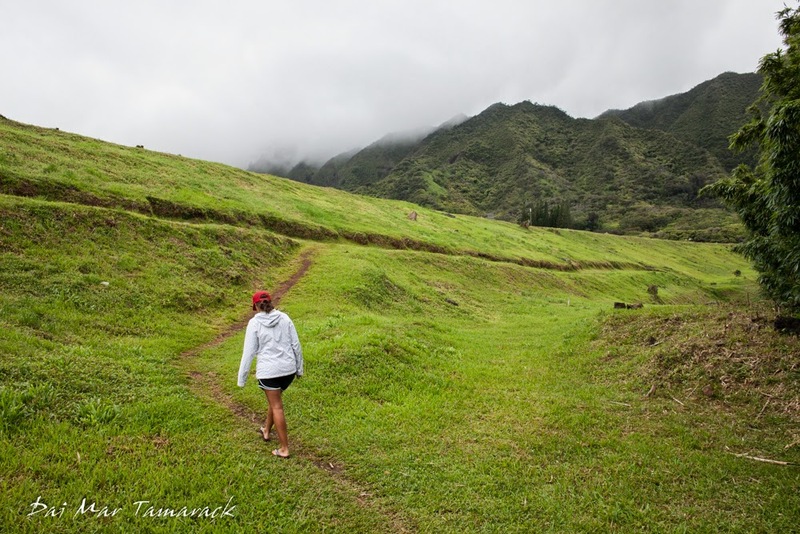 The trail then led up and over the hills along the coast back towards Hanauma bay. 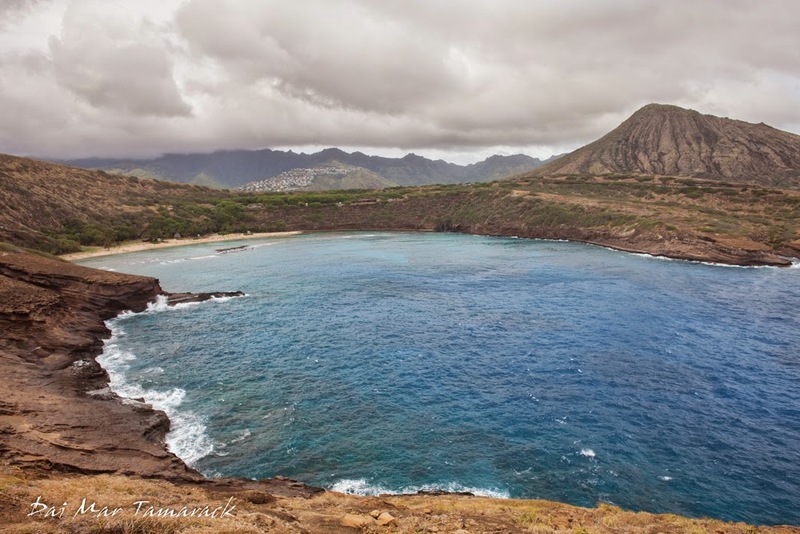 I walked far down to the northern point of Hanauma to take some pictures. It was a new perspective on a place that has been photographed many times. From here I could see it was possible to get down to the waters edge. I almost turned away to head back but something pulled me to climb down. That adventurous spirit paid off! As I got down to the bottom I could see the rock bridge! 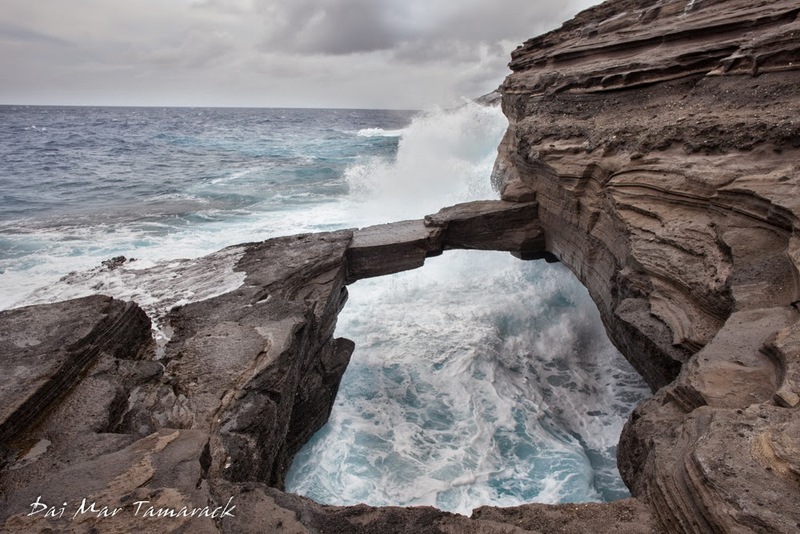 Every once in a while a large wave would splash up onto the arch from the ocean side and from underneath. I decided it was worth the chance for a picture after a father son hike team came down after they saw me. I made sure to time it and move fast but I made it out onto the arch to grab the picture and the proof. And I even stayed dry. 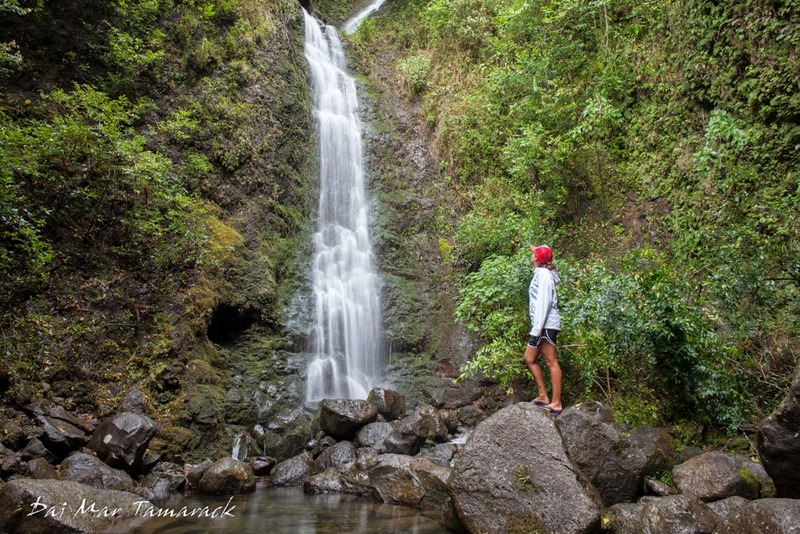 Search Hawaii Hike for more hikes around Oahu. 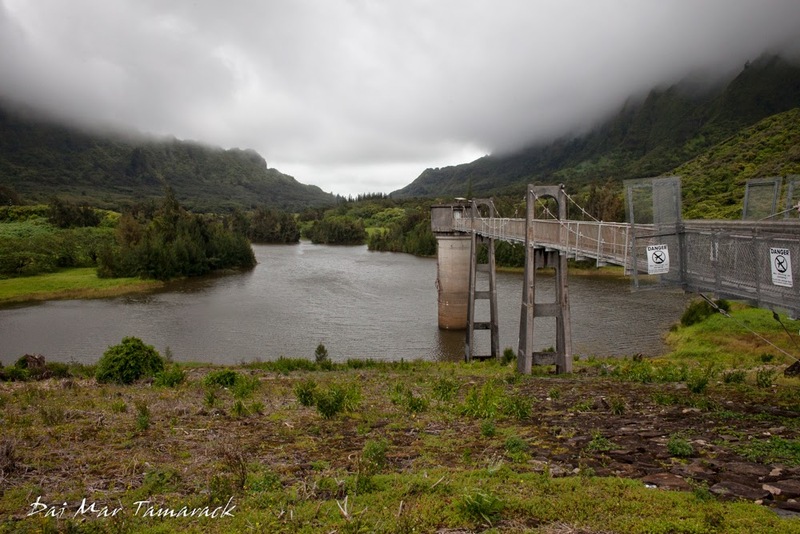 The Kawai Nui marsh is the largest wetlands in Hawaii at a little over 800 acres. I've seen people walking far out through the marsh over a levy but I've never stopped to really search for the trail head. 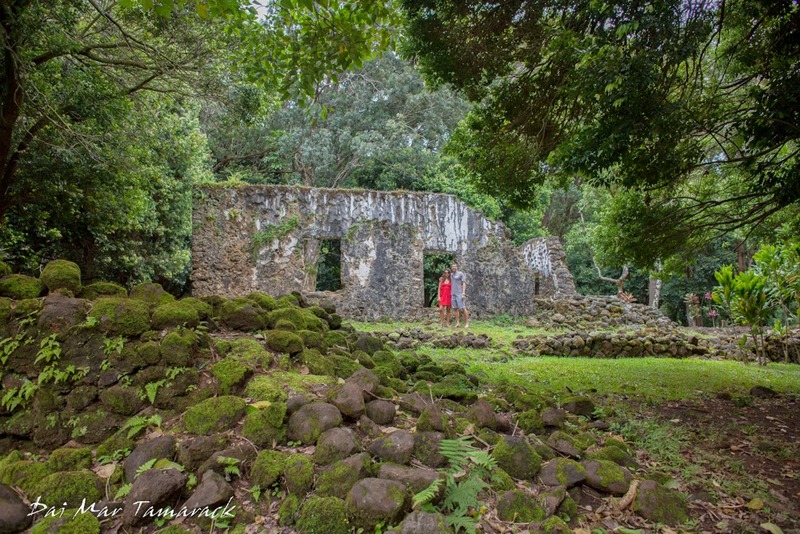 Heidi and I searched for a bit and found a trail leading to this big, lava rock outcropping. It provided a great view over the marsh and even a little trail down to a fresh water pool, but no access deeper into the marsh. 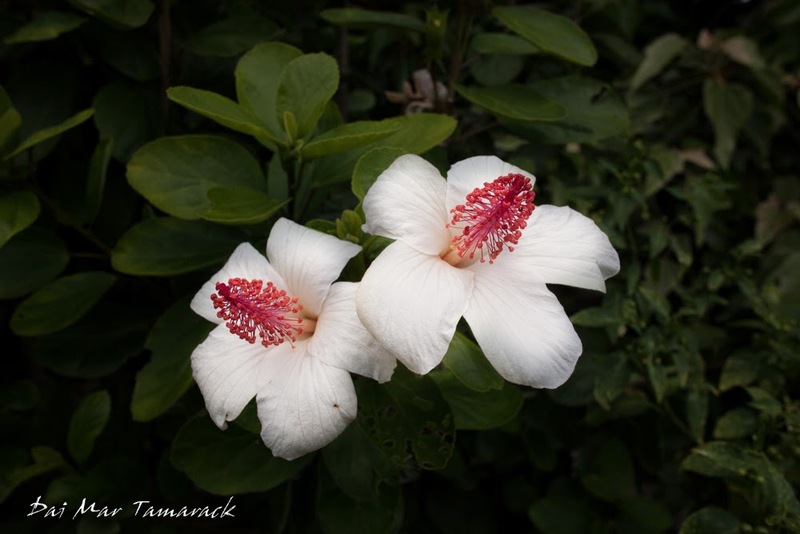 After admiring some of the beautiful flowers growing around the trail we got some advice on where to find the trail to the levy. 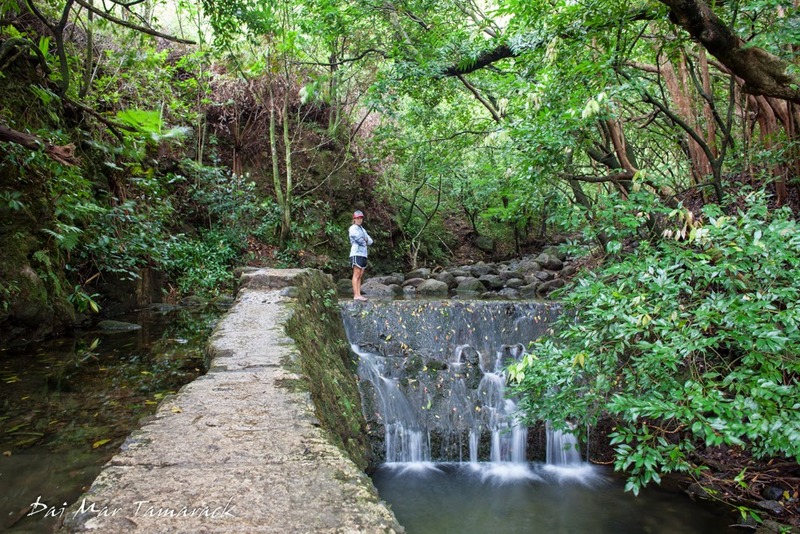 Our local advice proved much better than our smart phones so we were soon on the path leading out into the Kawai Nui marsh. 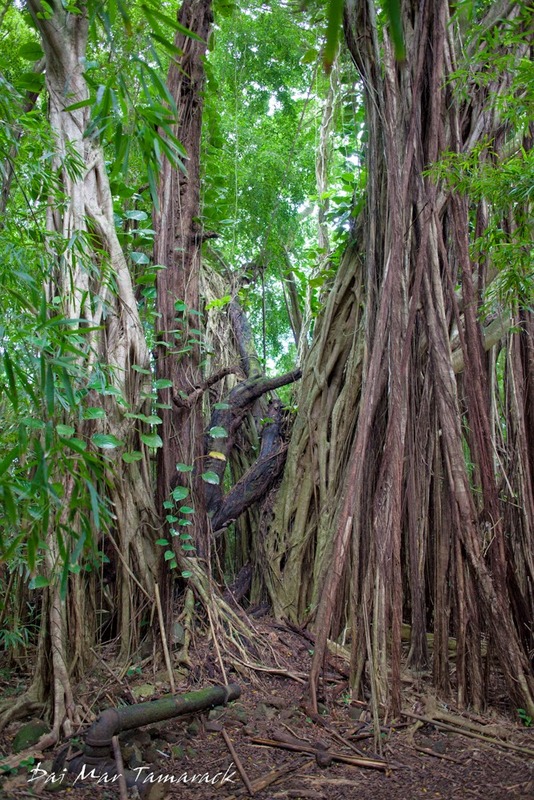 It is always interesting hiking through a part of the islands that is so unique. 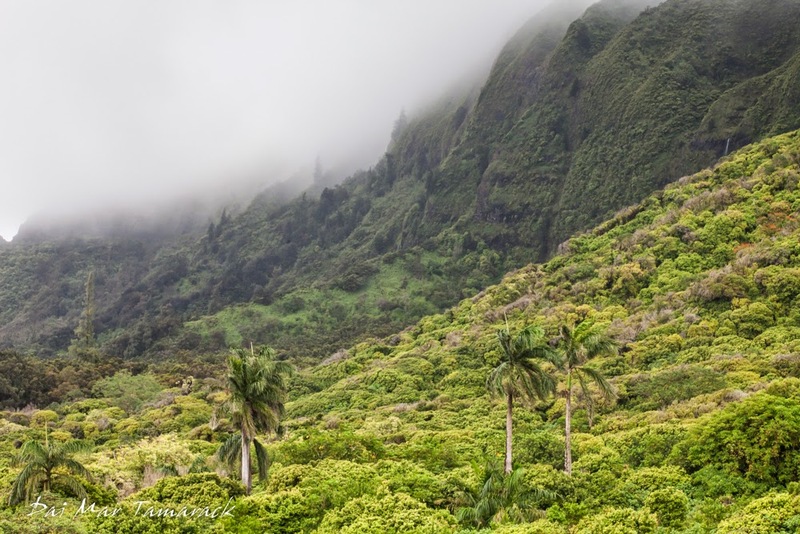 There are so many different environments here from rainforest, to desert, to wetlands, to sub arctic tundra. 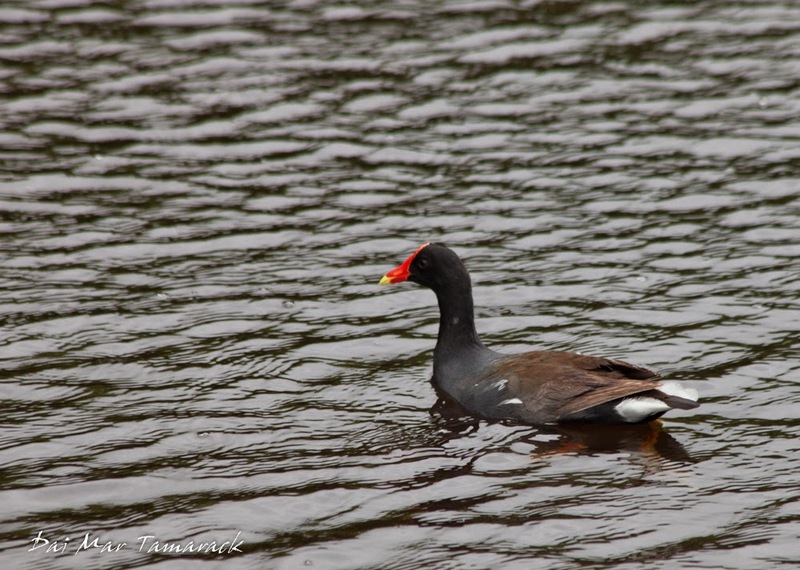 We saw a couple of ducks and Brazilian cardinals with their bright red heads. 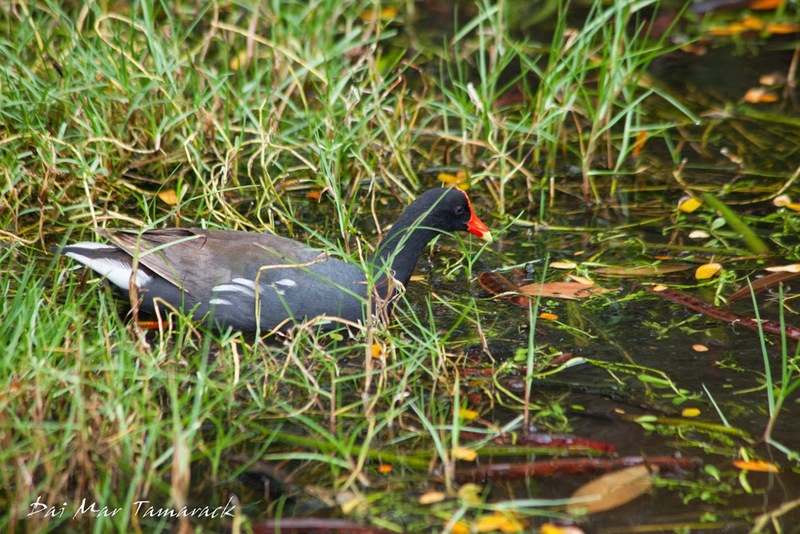 But the real treat came with a couple sightings of the endemic Hawaiian moorhen. 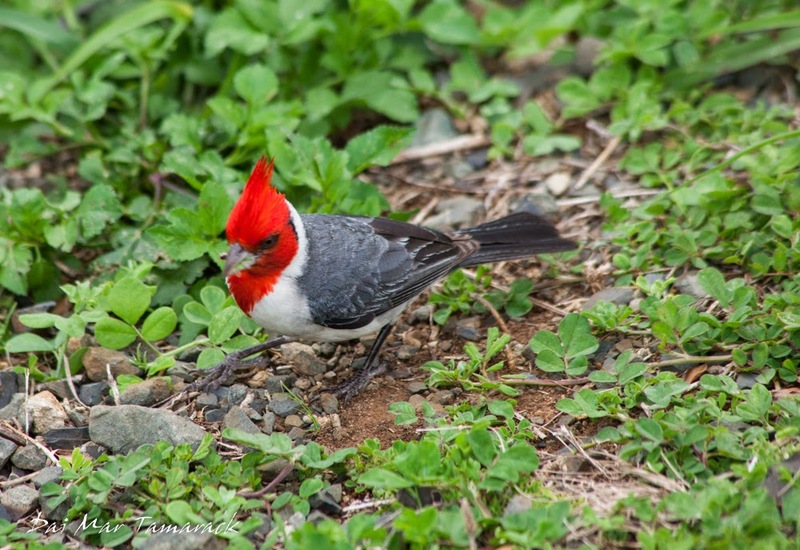 It is easy to identify with its red beak and head shield. It's nice to see some of their habitat remains. 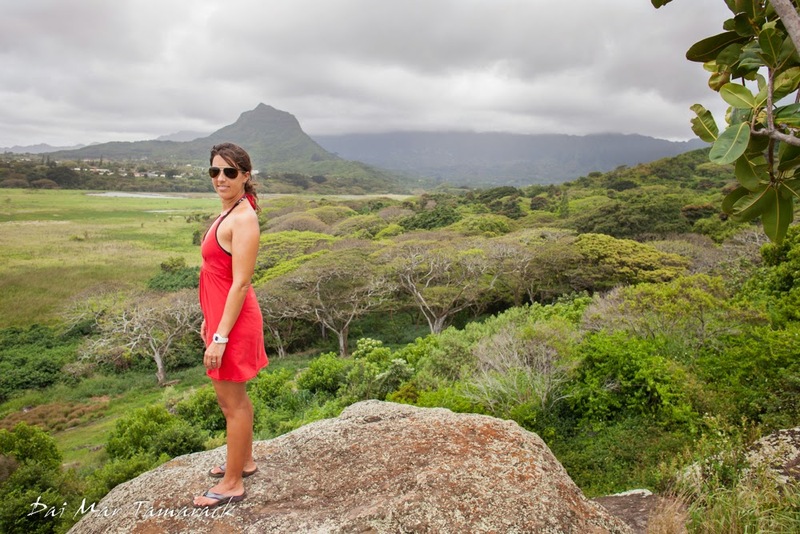 I have been researching 'off the beaten path' hikes and hidden natural treasures here on Oahu for the past few weeks. There is an underground network of hikers here that trade information regarding hikes that are not marked, and some that are marked 'no trespassing'. 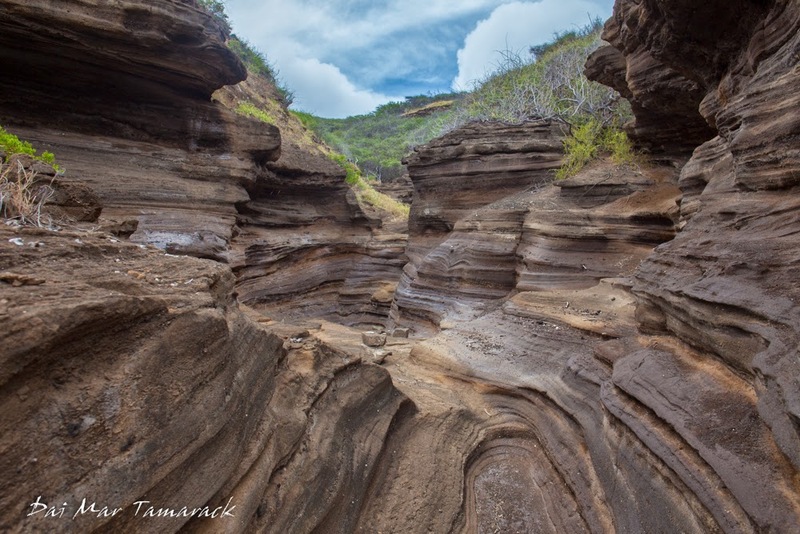 Photos of natural rock arches, hidden waterfalls, and beautiful landscapes turn up in my searches, but one image stood out. 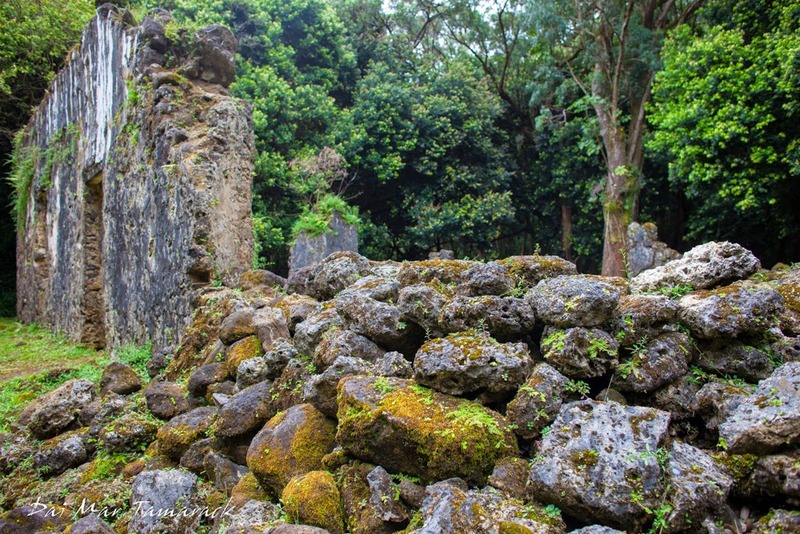 I came across the image of old stone ruins, but not like the ancient heiaus or temples, this had some intact doorways and walls, and was surrounded by jungle. Heidi and I searched for more information and once we got a starting point we decided to begin our search. We had high confidence after finding Lulumahu Waterfall the day before. We had an idea of where to go, but once again it turned out to be search. 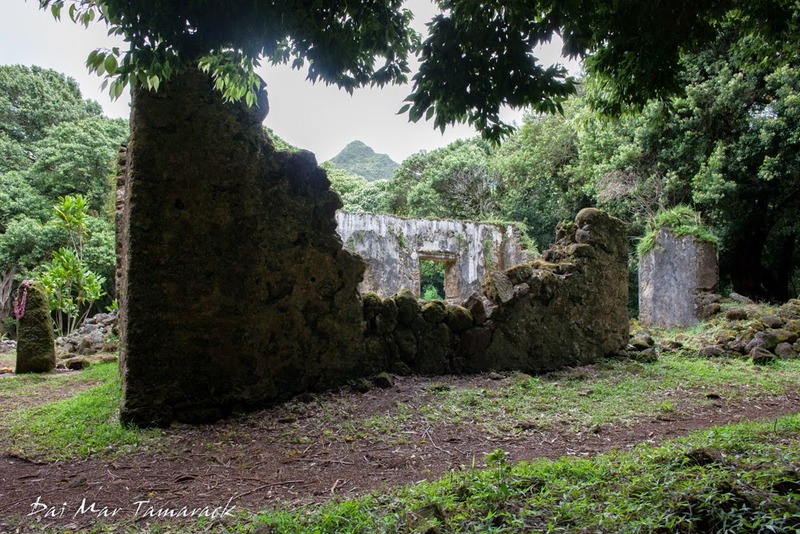 We met a couple of hikers coming back down the trail who told us we chose the wrong turn at the fork and the ruins must be down the other way. So we backtracked and took a left at the fork. Soon after the ruins appeared in front of us. 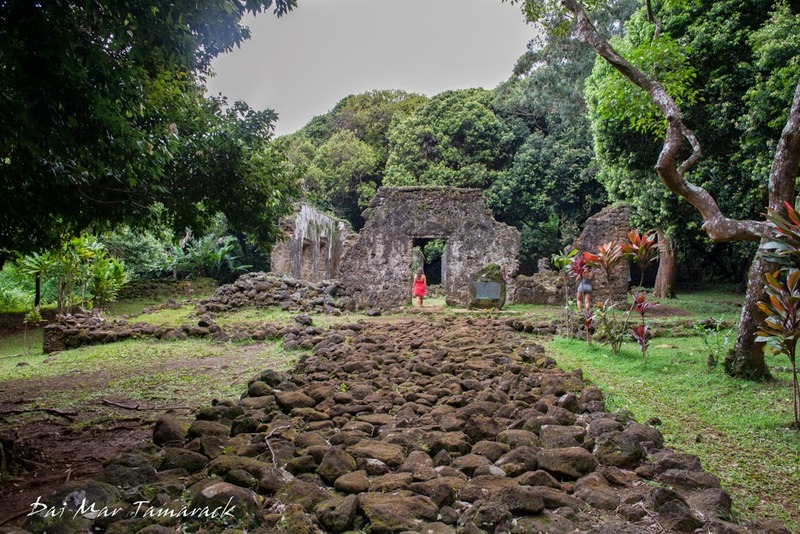 The Kaniakapupu ruins are an amazing historical site. 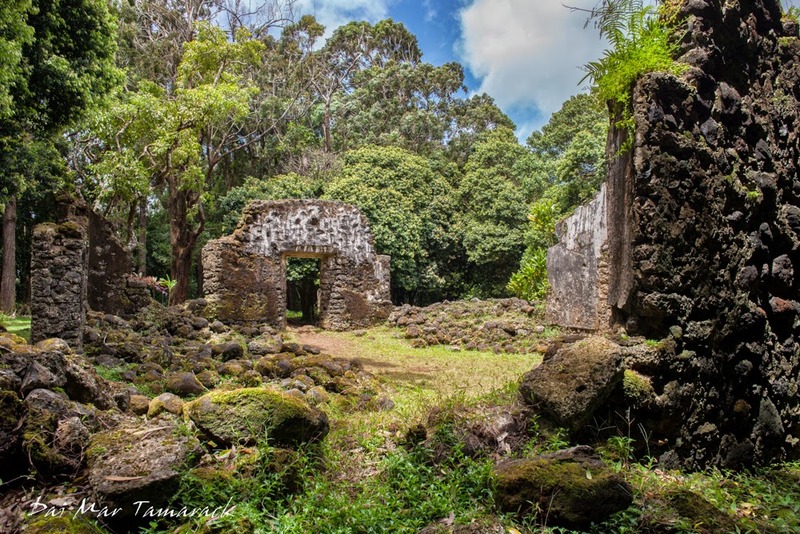 They are the ruins of King Kamehameha III's summer house. 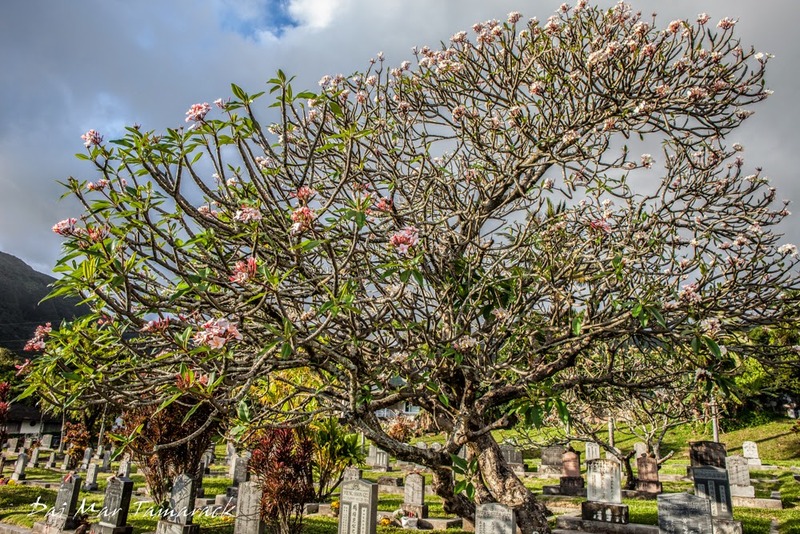 They date back to 1847 and were only used for a couple of decades before being discarded. I was shocked that this place isn't protected as a national historic site. 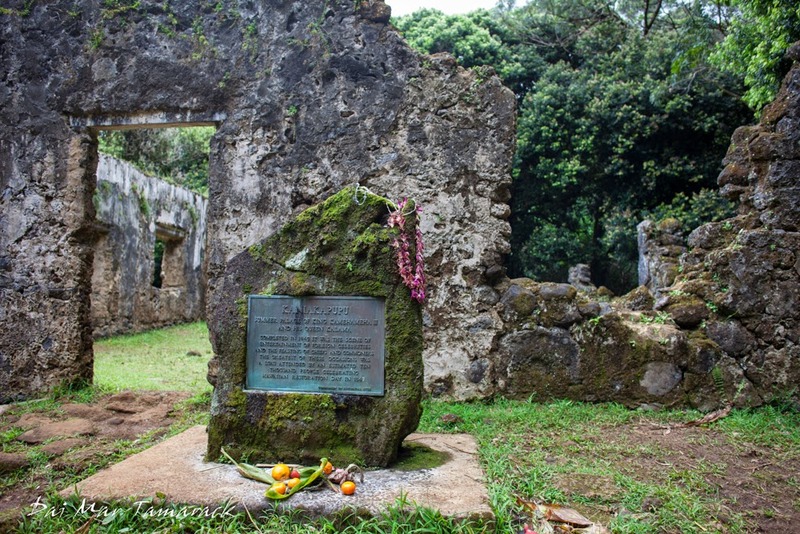 A plaque on site states the name of the ruins and also describes an event held here were 10,000 people attended. It's hard to imagine that many people in this small plot of land. I imagine that it is only a matter of time before this place is back on the tourists' map and preserved by the government. 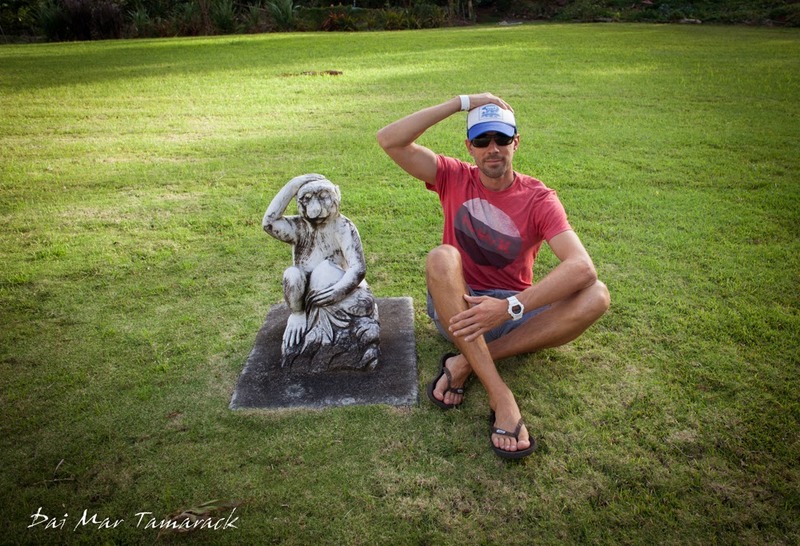 But for now if you are lucky enough to find it then you can have an ancient Hawaiian experience all to yourself. 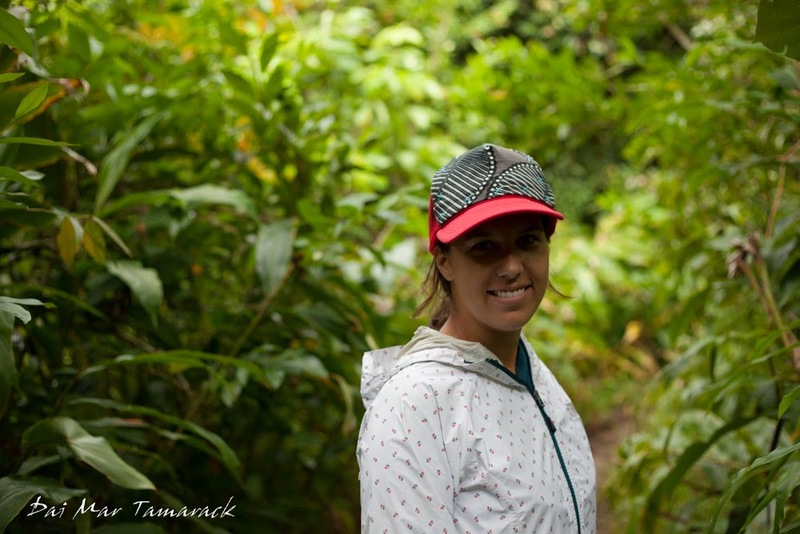 There are all kinds of hikes here on Oahu from ridge line hikes, to coastal treks, to muddy hikes thru lush rainforest. This hike was definitely the latter. 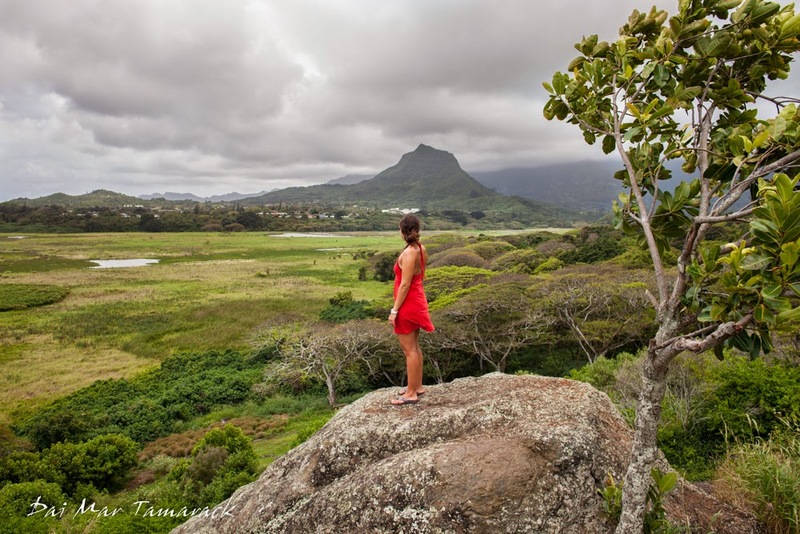 This is one of Oahu's popular forbidden hikes. It is off of the Pali highway, and cars are often parked at the trailhead, but keep out signs are posted all along the first park of the hike. 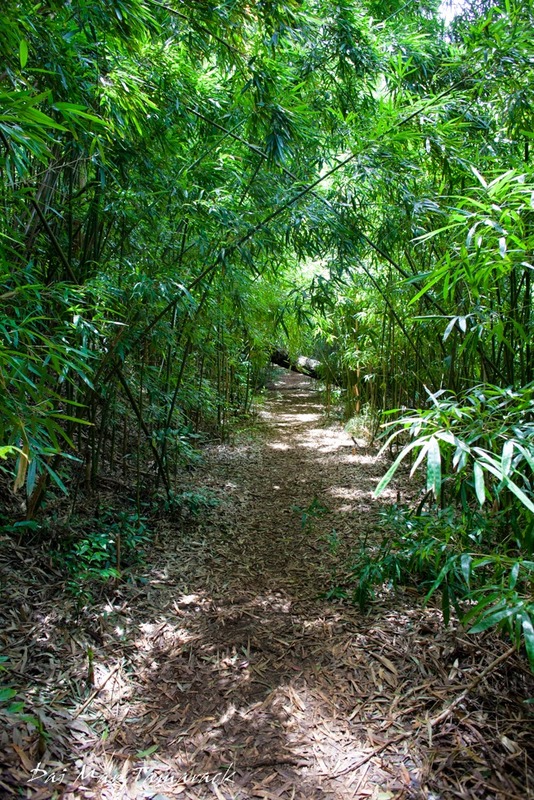 After a brief walk through a dense bamboo thicket the trail emerges at a huge reservoir. "No Diving" signs were posted along the concrete pier. 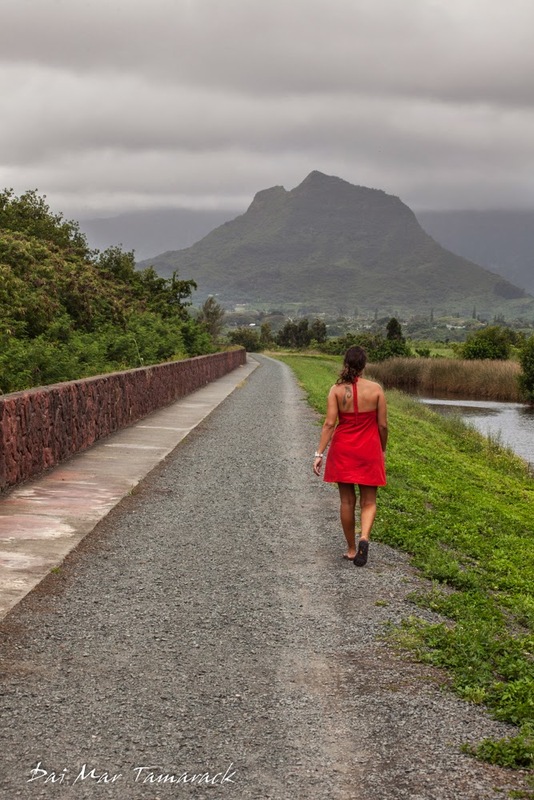 I've always wanted to explore this part of Nuuanu valley. 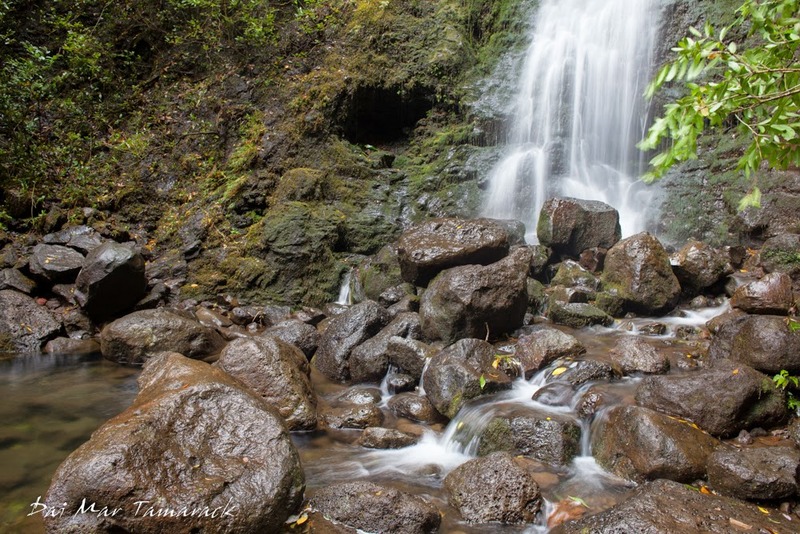 On rainy days I've seen numerous waterfalls cascading off the steep cliffs in this valley. Now was our chance to explore. I found out about this hike after doing a little research online. I couldn't find very precise directions, so we initially followed the path marked with pink ribbons tied around the trees. Turns out that it was the wrong trail. We followed the ribbons deeper and deeper through the mud, until finally arriving at the end, we found a pig hunter's camp. Time to turn around. We backtracked until a fork in the trail and took the other direction. 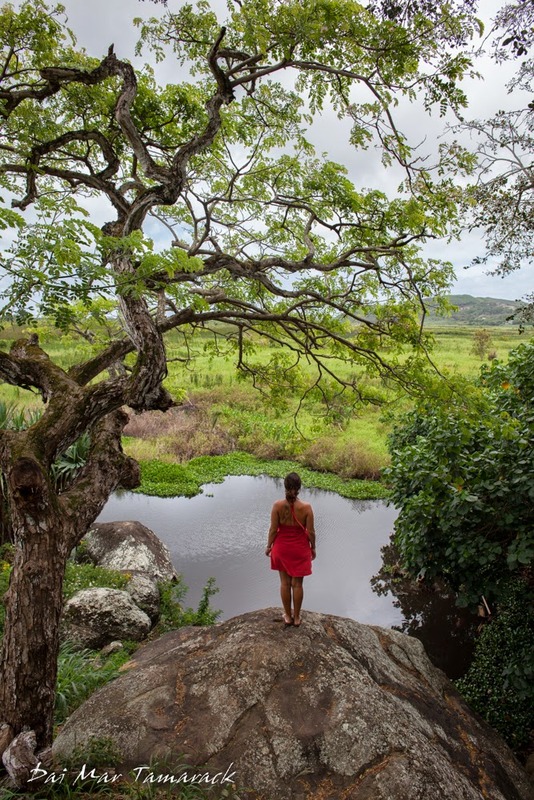 Once we found this stream we knew we were on the right track. Again the trail led us off course, this time up and to the right. Luckily we met some hikers coming down who told us it was not the way. We safely slid down the muddy hill back to the river and found the correct path again. 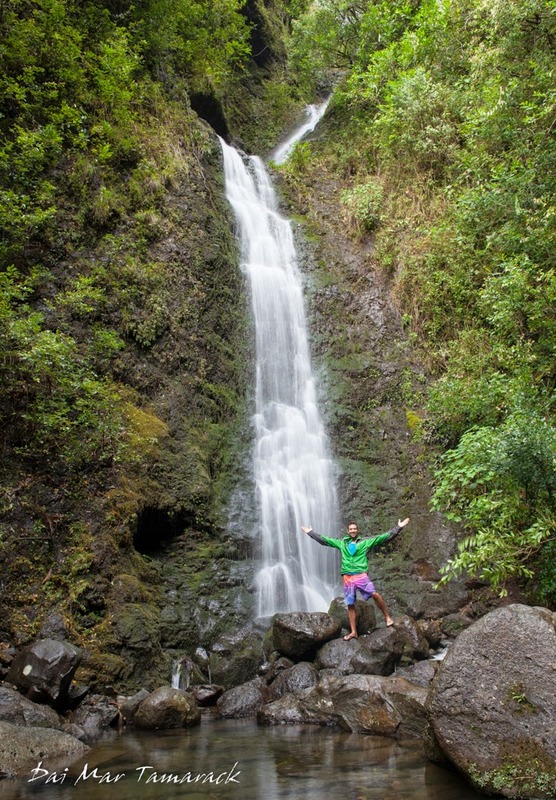 After a few more minutes of rock hopping and multiple stream crossing we came upon a beautiful three tiered waterfall. 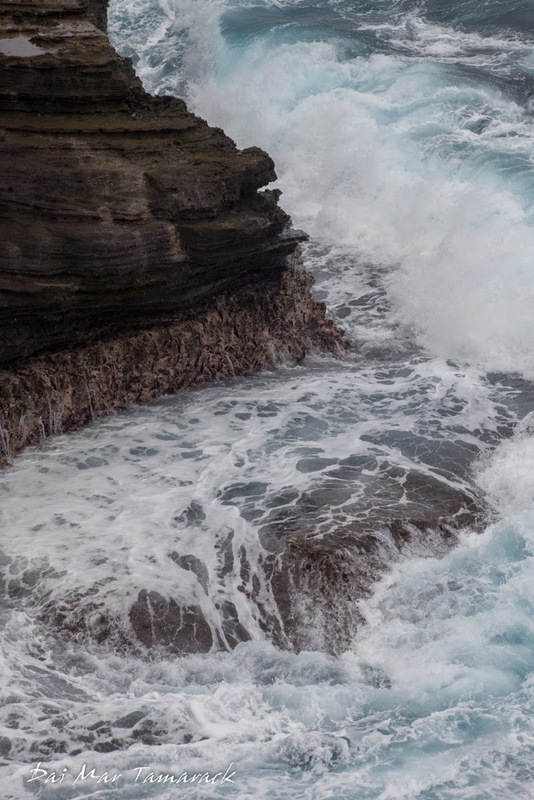 The water tumbled down on a pile of rocks and emptied into a shallow, clear pool. We stuck around for a few photo opts. 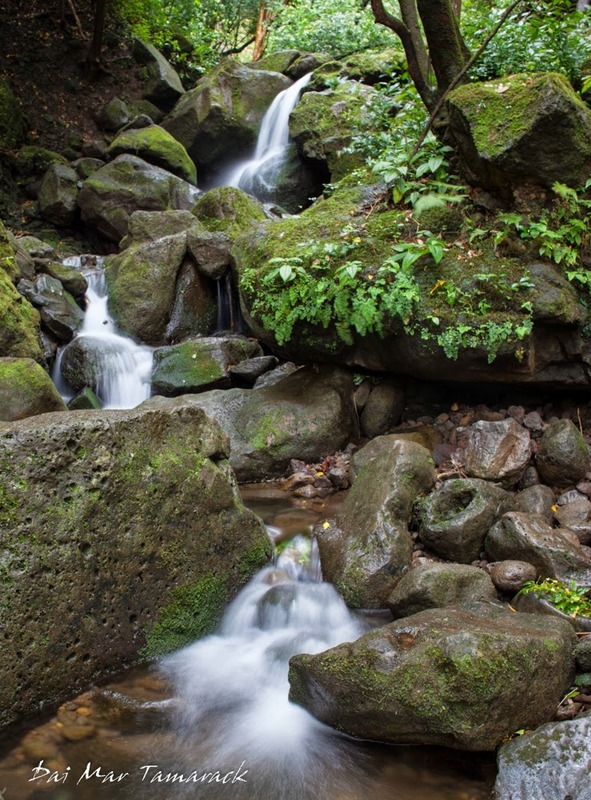 The long exposures turned out nice with the water flowing down and around all the rocks at the base of the falls. Sometimes hikes like this, where you have to overcome some obstacles and end up getting a bit lost along the way, make for better adventures and more memories. 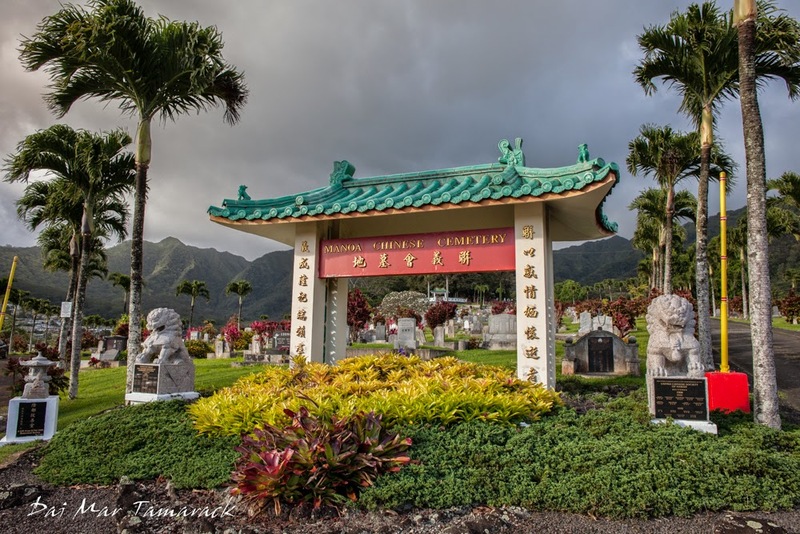 A beautiful Chinese cemetery sits atop a green hill deep within Manoa Valley. 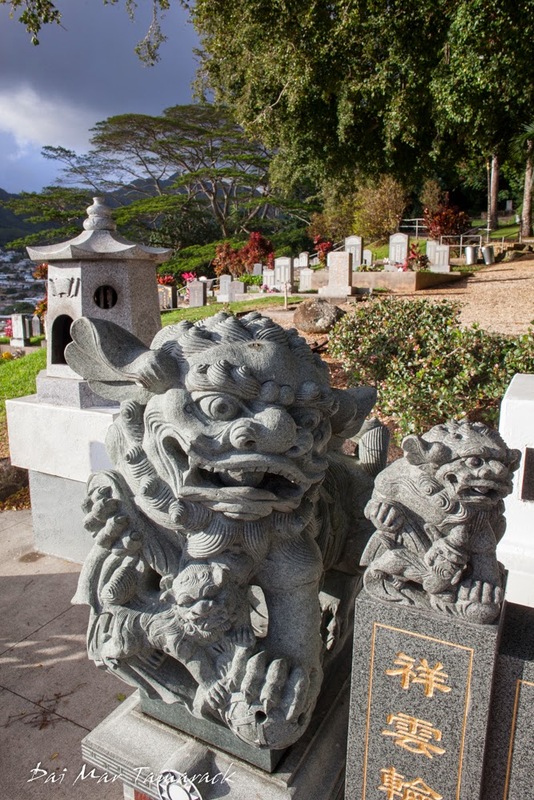 Also known at Lin Yee Chung Manoa Chinese Cemetery, this spot is open for visitors until 6pm daily. 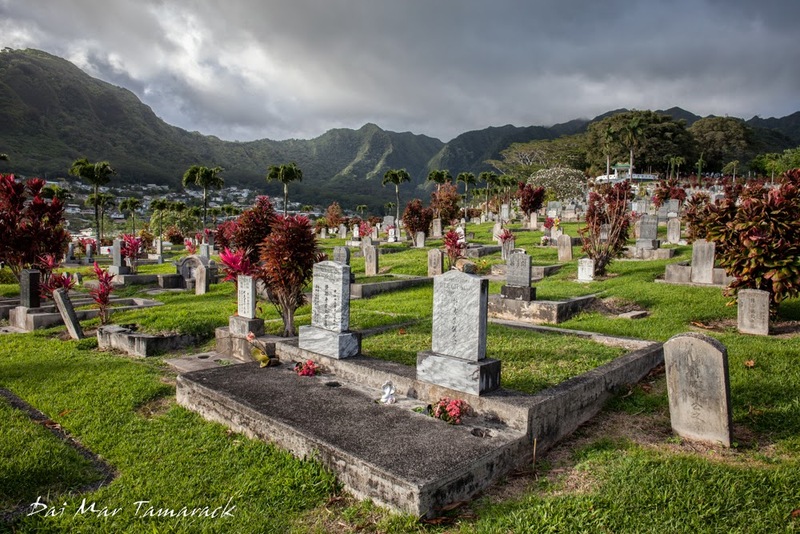 Heidi and I had turned back from doing a late Manoa waterfall hike due to some rain showers so we decided to walk around the cemetery grounds instead. I had been here before but never close to sunset. 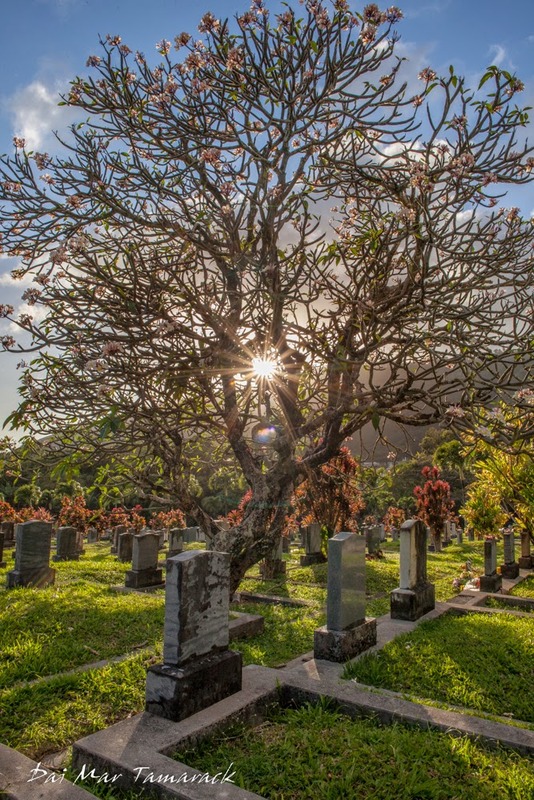 The low sun cast long shadows on the gravestones and gave the entire scene an ethereal aura. We could look down the valley towards the ocean and see the high rises of Waikiki, but it seemed very far away from our serene spot. 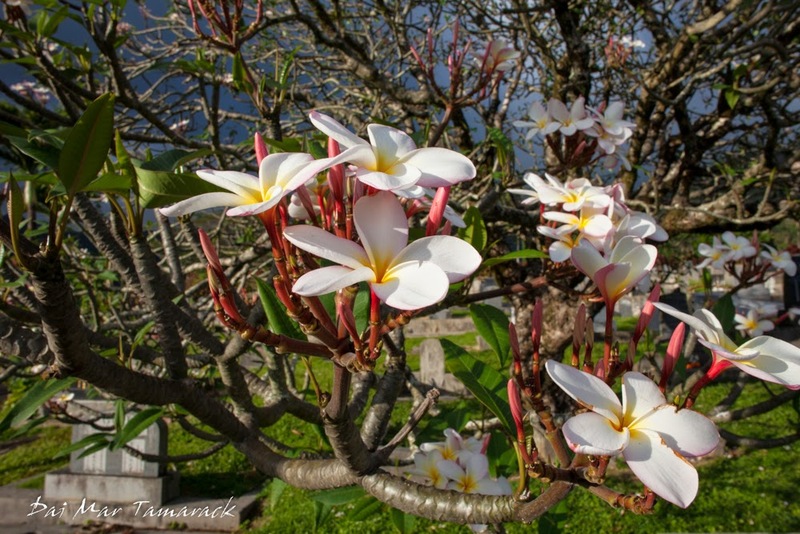 Giant plumeria trees offered easy pickings for flower offerings for the deceased. And intricately carved animal statues stood guard over some of the bigger graves. 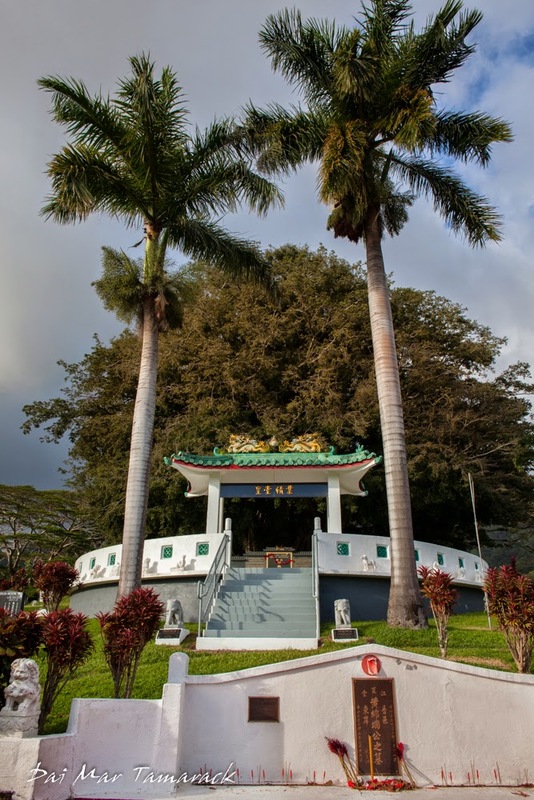 At the top of the hill stood a huge banyan tree and the grave of Lin Yee Chung, the grand ancestor. Heidi and I walked around for a while, never seeing another soul. In our exploration we stumbled across statues of the Chinese new year animals. Heidi posed next to hers, the dog, and I threw out my best monkey pose. Both animals are very fitting. I don't know if I will see this place so gorgeous ever again. The dark rain clouds behind, beautiful foliage within, and incredible colors all lit up during the magic hour. It's times like this I am glad I have a camera.